Earlier this summer, the Atlanta City Council unanimously passed its annual budget, which included an increase in funding for the arts — doubling the current funding, in fact. And to add to the hype, the City of Atlanta, Atlanta Super Bowl Host Committee, and WonderRoot are teaming up to grace ATL with 30 new civil rights and social justice themed murals before Super Bowl fans flood the streets this February. 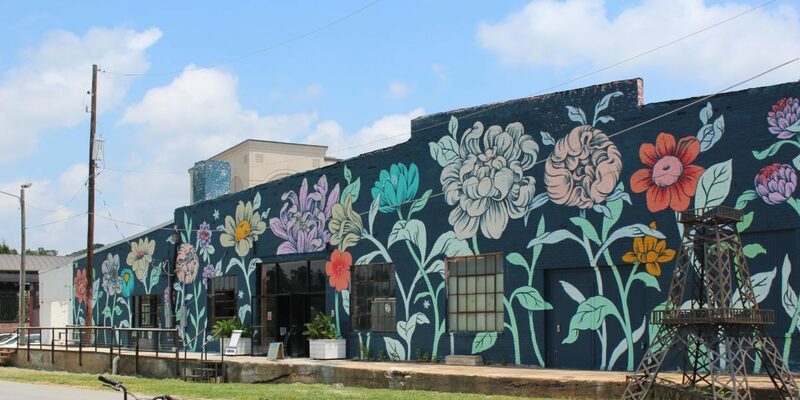 The upcoming mural creations will bring to life two areas: the neighborhoods surrounding the Mercedes-Benz Stadium — English Ave., Castleberry Hill and Vine City — and downtown Atlanta. The city hasn’t settled on designs just yet, but will be developed during community conversations by the nine artists that are tasked with the job. The artwork will begin going up this fall and is to remain a permanent addition to ATL’s cultural scene long after the game is over. Local muralist Fabian Williams, better known as OCCASIONAL SUPERSTAR, seeks to permeate the streets with colorful civil rights era figures, and doing so without bounds. 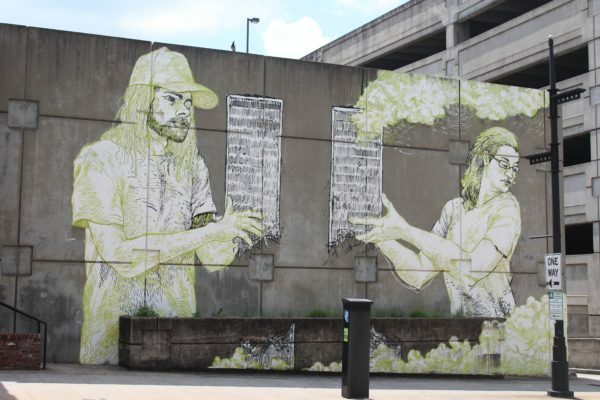 The North Carolina-transplant was one of many muralists who joined forces to file a lawsuit against the city in 2017. 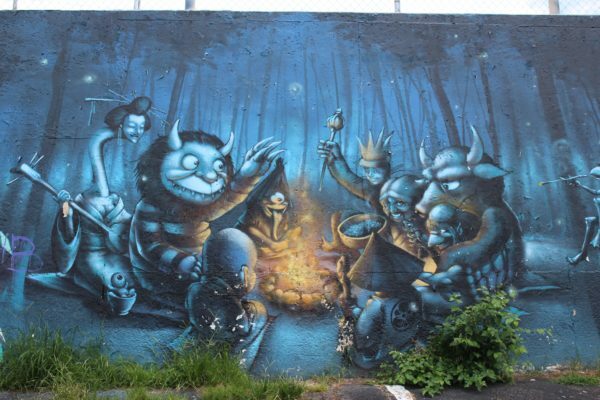 The city introduced an ordinance that would require artists and property owners to go through the city and their homeowners association before adding murals and other artwork visible to the public. The artists sought out the right to display painting on private property without excessive government interference. The suit claimed the city hall approach violates the constitutional rights of the artists. The artists won. Other muralists, like Sanithna Phansavanh, see working on public murals as a nice change in pace. He says working behind closed doors is very intimate, while completing public art invites passer-byers into the entire process. Each year, the City of Atlanta Mayor’s Office of Cultural Affairs hosts ELEVATE, a temporary public art program that seeks rejuvenate the city streets through visual art, performances and cultural events. Each October, ELEVATE presents a theme for artists to incorporate and explore with their work. 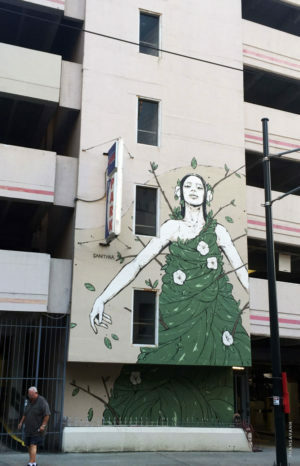 In 2012-13, the theme was “Forever, I love Atlanta.” Phansavanh crafted “Growth” with this theme in mind, extending to his perspective of Atlanta as “rising from the ashes.” The woman represents the city, while the vegetation sprouting from her body represents regrowth. Several of Phansavanh’s murals depict women figures. “I think women are the most powerful, strong and important members of our society. Also, as I was growing up my mom had a painting that I adored, and I’m realizing that I’m trying to recreate that painting,” he said. The project “Not a Crime” began in September 2015 with 11 murals on education equality and freedom of expression painted around New York City. The series expanded to Atlanta, echoing the Southern views and civil rights that are rooted deep in the city. 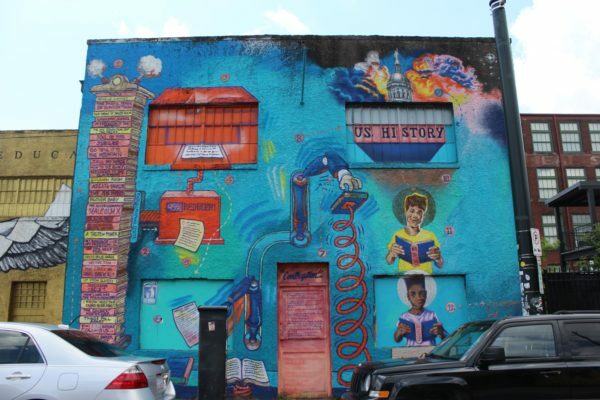 The mural depicts children studying history. William’s vision of the piece brought back memories of third grade. He wondered why lessons of George Washington chopping down a cherry tree was such a moral issue taught repeatedly, but that the former U.S. president once owned slaves was not. William’s continues his artistic works of activism with a vibrant murals, such as the fluorescent painting of American civil rights activist, philanthropist, businessman and scientist the Rev. 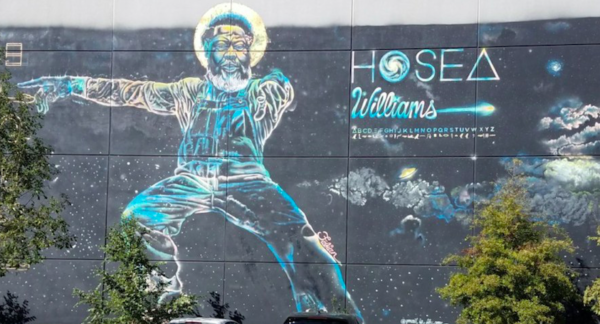 Hosea Williams. Skie is an Atlanta-based artist specializing in typography, fine art and graphic illustration. 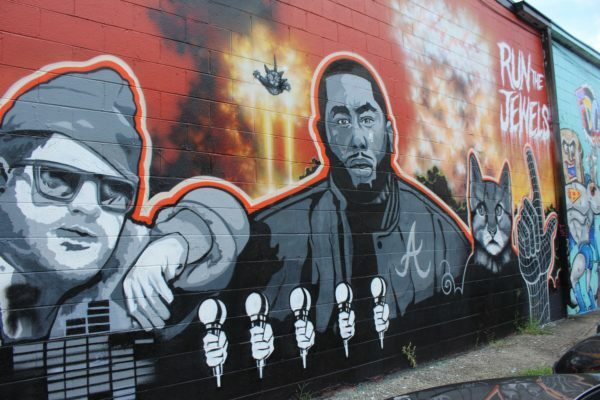 The Run the Jewels mural was painted behind Junkman’s after Skie attended the Afropunk Festival in 2014. Run the Jewels is the hip-hop super duo of New York-based El-P and Atlanta-based Killer Mike. Mr. Totem is a local artist who completes artistic works for both commercial and personal purpose. “Where the Wild Things Are” was painted on the fly last year in Little 5 Points, which is “home for us creative weirdos,” as he puts it. John Lewis came to Atlanta five decades ago as a founding leader of SNCC— the Student Nonviolent Coordinating Committee. 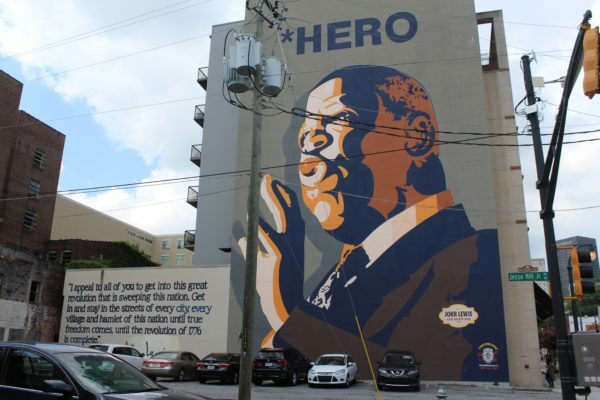 Schwab’s mural is a dedication to the U.S. congressman and civil rights icon. The mural reads, “I appeal to all of you to get into this revolution that is sweeping this nation. 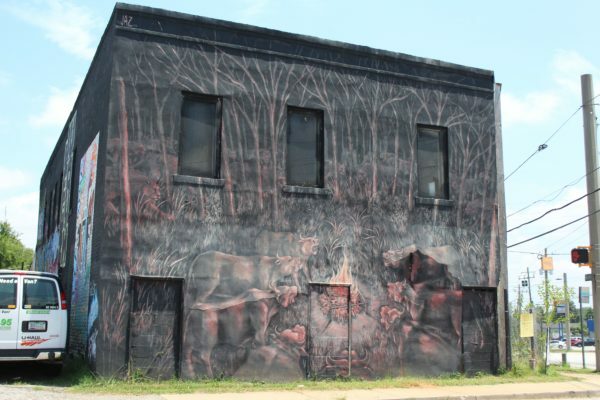 Get in and stay in the streets of every city, every village and hamlet of this nation until the true freedom comes, until the revolution of 1776 is complete.” The mural was part of the Loss Prevention’s “Hero” series of art installations. Where: Bell Street near the intersection with Auburn Ave. 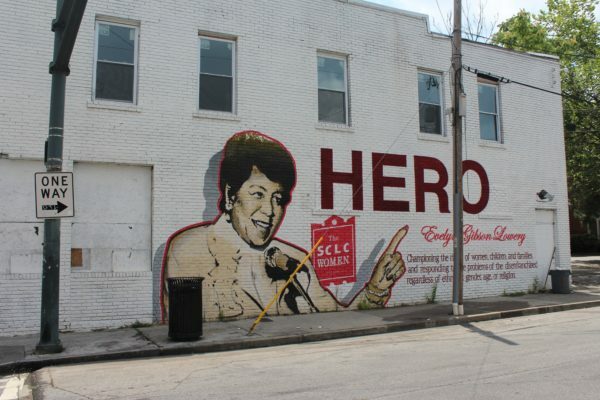 The Evelyn Lowery mural marks the second public art installation in the “Hero” series created by the Loss Prevention. Civil Rights leader Evelyn Lowery died in 2013, at age 88. She championed the rights of women, advocated for marginalized members of society and fought for those causes in the face of death threats. 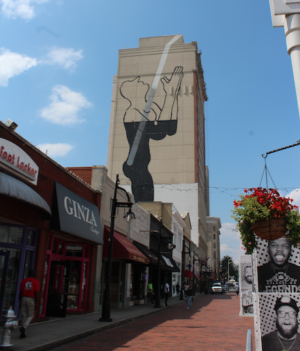 Lowery’s legacy is remembered and honored through the mural painted on the side of a two-story former nightclub on the corner of Auburn Avenue and Bell Street. It is a few blocks away from where she founded the Southern Christian Leadership Conference’s sister group, Women’s Organizational Movement for Equality Now, Inc. (W.O.M.E.N. ), in 1979. 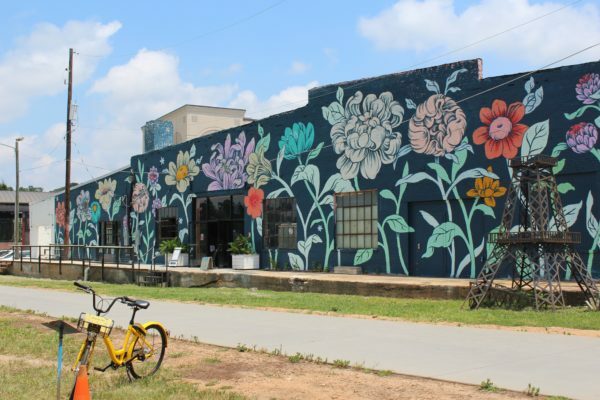 The Detroit-based artist Ouizi — whose real name is Louise Jones — blasted the Beltline-facing backside of Paris on Ponce with a floral look. Much of Ouiizi’s works touch on the theme of her Chinese-American roots. Where: 230 Flat Shoals Ave. S.E. All the way from Buenos Aires, Argentina, Franco “Jaz” Fasoli is a street artist who works in the traditions and styles of fine art. Jaz was in town during the 2013 Living Walls Conference. The Argentinian artist quickly painted this signature piece, which features intricate details. Much of his work provides emphasis of nations in Latin America. 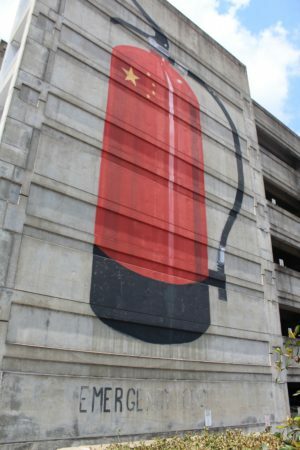 New York-based artist, LNY, produced a mural on Pryor Street as part of the 2011 Living Walls conference that honors New York’s World Trade Center’s fallen towers. The figures in the mural are inspired by his two volunteer assistants that helped with the project. The portraits depict appreciation to the efforts of many that helped bring his work to completion. Escif Tokidoki, more commonly known as ESCIF, is a street artists who hails from Valencia, Spain and known for his large-scale public murals. In partnership with the 2011 Living Walls Conference, ESCIF was invited to Atlanta to produce this, six-story-tall mural for the “Elevate” series. The red fire extinguisher holds the inscription “Emergency Only” at the bottom and small yellow stars of the Chinese flag at the top. The brainchild of Flores, several local artists picked up brushes and contributed to bring Azteca Moderno to life earlier this month. The project highlights the history of the Mexica and Aztec empire. The murals are proudly supported by Cultivating Cultures, Art is King and Azalea Creative Group. 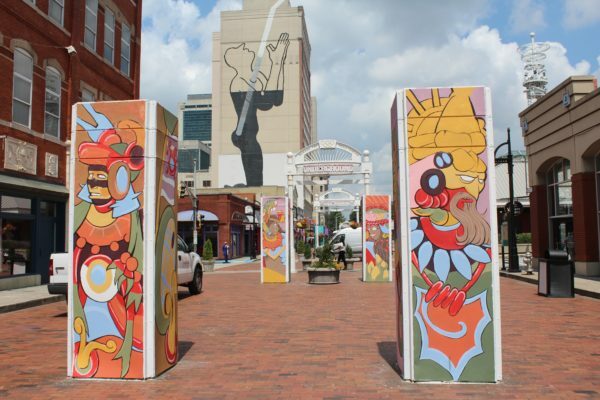 SAM3, an artist from Spain, presents “HOPEFULNESS” in Underground Atlanta. In partnership with the 2011 Living Walls conference, the mural was created to express the sense of hopefulness and a full heart. The mural covers more than 15 stories.